A possibility is to look into seeing if you can use the custom mod that Crafting Paradise uses, it has it so that you create research notes which you can then set to a biome and automatically gain points as you spend time in the relevant biome. For the microblocks wouldn't they only be an issue if they're actually used? Since otherwise they should have very little memory footprint at all. I'll start looking at more things to do with unifying the mods, so far the only thing I've spotted is that pulverizers don't support clumps from mekanism but probably should as macerators and crushers both do. Although actually that leads into a different issue, is there a particular tech mod you want to focus on? Since some things like the crusher/macerator/pulverizer could have two of them removed and the recipes just shifted across to the third to simplify things and unify it all. I don't want to disable machines of mods, the thing that i want for Stirecraft is that people can choose what mods they want to work with, so if people want to use IC2 or Mekanism they can. I am currently trying to change recipes to only output Thermal Expansion Tin and Copper, so you don't get the multiple copper situation. I already changed the IC2 copper dust to cook into Thermal Expansion Copper Ingots. I've only thing i changed from Extra TiC was that i disabled Steel being created from Iron and Manganese in the Smeltery. Paxels have been disabled due to a Havestability Level Bug that allowed you to for example mine Cobalt Ore with a Stone Paxel. You can now also chisel Project Red Marble and craft Project Red Marble Bricks back into Raw Marble, see NEI for recipe. So you want it to be about every mod being usable over a focus on one? That works too, I'll still ask if there is any you want to focus the recipes around then, things like how you have Mekanism's steel casing, and TE, MFR and IC2's machine blocks. Which way do want to go like making all the recipes Mekanism style, or TE style or whatever. Since as far as unifying mods goes making all the machines similar is a good first step, admittedly removing some of the redundant machines would also be good but if you could config them to be basically identical it would probably work even better and be inline with your idea of choosing between mods, you wouldn't be inclined to go with one because it's cheaper or because it has unique recipes. I'm not sure about machine recipes yet, i've spend the last couple of days trying to unify the ores so you don't get multiple copper or tin ingots again. MFR has build in TE recipes so i enabled them in the next version, apperantly there's also Nether Pig Iron Ore that generates in the nether, it is basicly Steel Ore, i think its very rare as i've never seen it, i don't want Steel to generate in the world but if its very rare, then i've got no problem with it. I'm also in the process of adding more recipes to IC2 and Mekanism but i'm very limited right now by Minetweaker 2. I've also made a poll on the top of the main post about the tool changes. Yeah I haven't actually used 1.7 yet so I can't really form an opinion for it and it's changes, I'm just basing all this off the 1.6 version. For mods to add while it's still on 1.6 add OpenPeripherals, makes ComputerCraft so, so much better. I'll just look into the 1.7 changes so I can try to form ideas that will survive the update for now. I forgot to ask, but did you add anymore quests in the previous update? 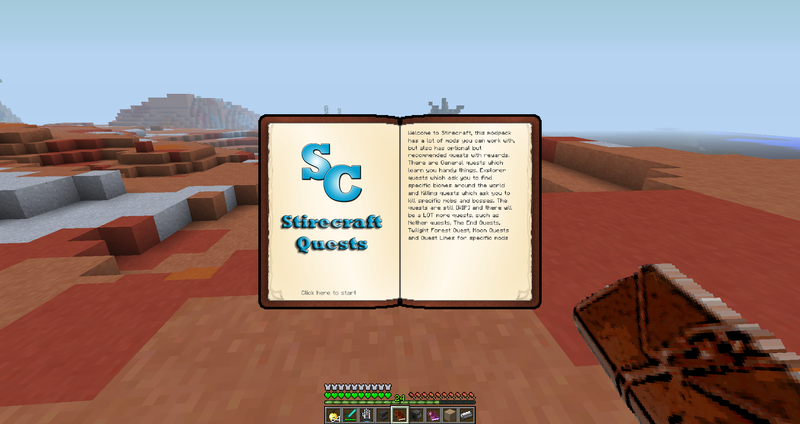 Yes i added a couple of Exploration Quests, i'll try to make a couple of new Exploration quests for the new update. If Mekanism doesn't like you changing its recipes why don't you just unify to Mekanism metals so it doesn't matter? As far as the quests go they seem alright, one minor suggestion though is to enable the BoP message about world type for start up, just as a little thing that could help if they don't already know about it. The IC2 Tool recipes have been fixed and 3 new Exploration quests where added. I also made a logo for the Quest Book. I can't update either, just don't update for now I suppose. Probably a corrupted file or something. I've posted a new Poll on the main post, this one is about the FPS you get. I want to know how the pack preforms on other PC's so i know if the pack isn't too recourse demanding and how much mods i could add. I want to know peoples FPS without Recourse Packs. The previous poll shows that a lot of people like the idea of making TConstruct tools the default tools. I've been busy the last week configuring Ores and Pickaxes to balanced Harvest Levels. There will be a total of 7 Harvest Levels. I will make the TConstruct tools being default easy to turn off. I'm also testing around with 1.7.10 and it's becoming more stable, i'm still waiting on a couple of mods to update and after that i've still got to move all the quests and configurations over. I've created a list of mods that still need to update on the main post. I'm also still waiting on a couple of mods to update in order to continue with the 1.6 -> 1.7 Map Conversion Patch. Here is a link to a spreadsheet with the current patch progress. I added NotEnoughKeys which cleans up the keybind menu, this mod won't be in the 1.7 version of Stirecraft because 1.7 forge has this build in. I also started on the Nether Quests, you can complete the first quest by going to the nether. Bronze can't be crafted in a crafting table anymore, you have to use a Smeltery, Metallugic Infuser or a Induction Smelter to get Bronze. And i moved the Dartcraft Energy Bar to the bottom middle for the same reason. I'm still waiting on a couple of mods to update to 1.7.10 before i can update the modpack. You can view a list of mods i am waiting on in the thread. I've added Tinkers' Steelworks, this adds new kind of Smeltery called a High Oven that can create Steel. To get the Info Book of TSteelworks you'll have to place a TConstruct Info Book on a Casting Table and pour Molten Seared Brick over it. I couldn't get Chisel Limestone to melt in the High Oven so you'll have to chisel Chisel Limestone into TSteelworks Limestone and melt that. I've also nerfed Mekanism Swords a little so they don't do as much damage. There are no new Quests this week because I've brought a new PC this week and i'm still moving stuff from my old PC so i didn't have the time to make new Quests. I've also updated Galacticraft and the Energy Conversion Rate has changed so if you power your Galacticraft Machines using RF or if you power your RF machines with Galacticraft Energy Generators (Solar Panels) then check your energy system for changes. Remember that if you find any bugs to inform me so i can look into fixing them.